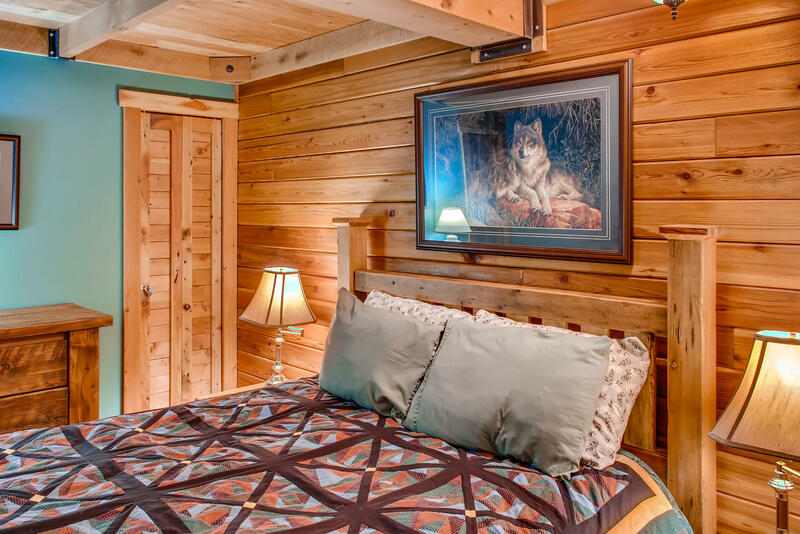 This is a perfect pet-friendly property for a family getaway or romantic weekend away! The wood floors, wood panelled walls, exposed beams and vintage lamps give this cottage an extremely rustic and cosy feel. There is a small slate entryway to leave your shoes and hang coats. This leads into the kitchen, which has been renovated with timber cabinetry, laminate countertops and tiled floor. 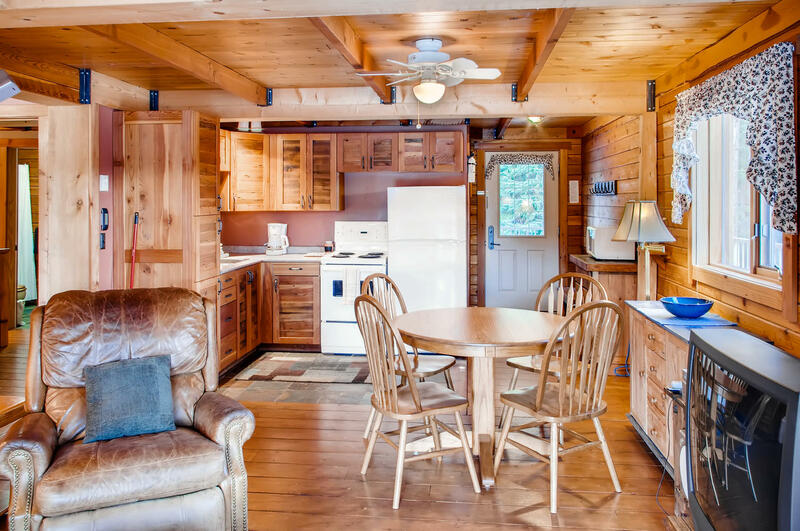 The kitchen has a freestanding oven with four cooktops, a large fridge and microwave. It opens onto a small dining area, with a round four seater table, great for intimate dinners. The lounge area has a futon, which can be used for extra sleeping space, as well as a comfy leather armchair and quaint wooden rocking chair. 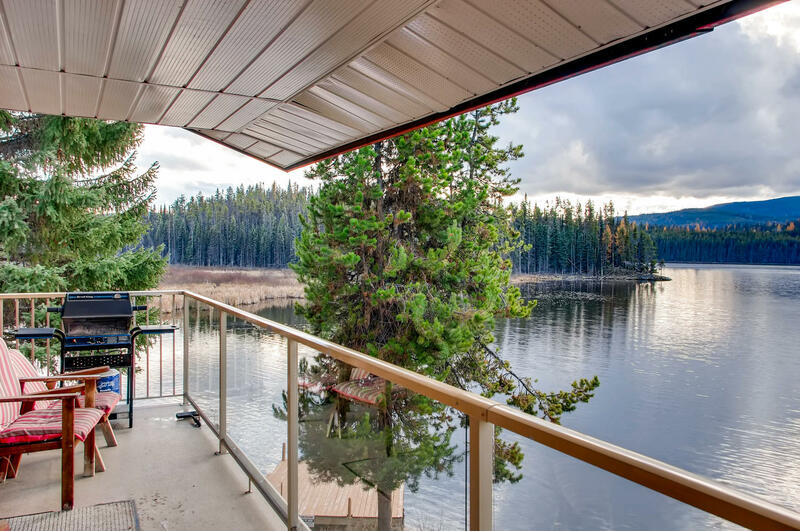 A floor-to-roof glass sliding door makes this the perfect spot for watching boats float by on the lake. 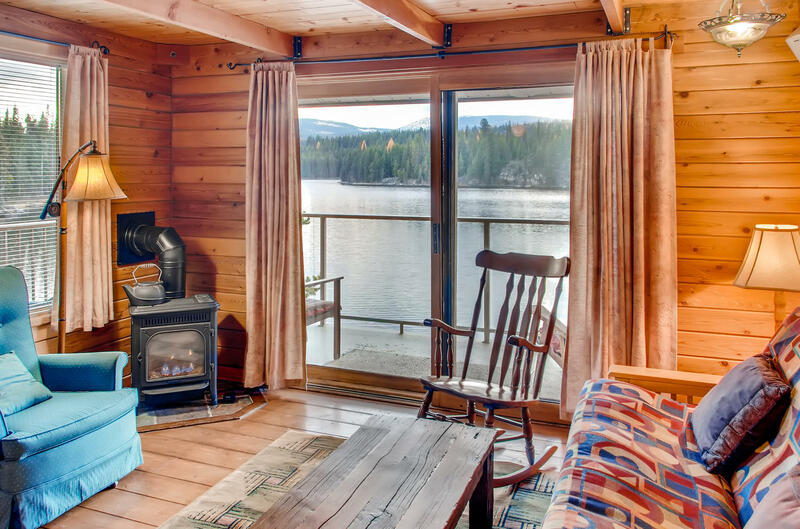 When it’s too dark to enjoy views of the lake, there’s a large box TV with DVD, VCR and surround sound, or curl up with a book in the rocking chair in front of the propane fireplace. There’s also an impressive collection of board games. 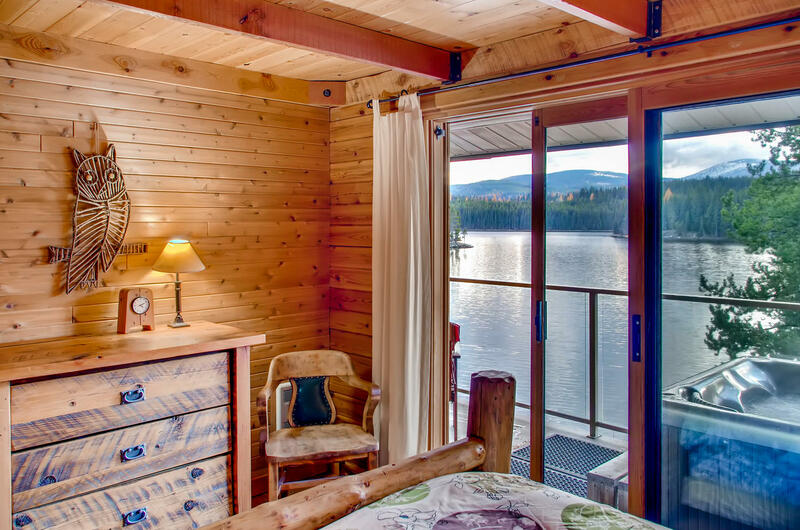 You can also while the dark hours away in your own private hot tub on the deck just off the living area and with views over the lake. The deck is equipped with a BBQ, as well as a table and four chairs, so that in the warmer months you can do most of your living outdoors to make the most of the beautiful outlook. 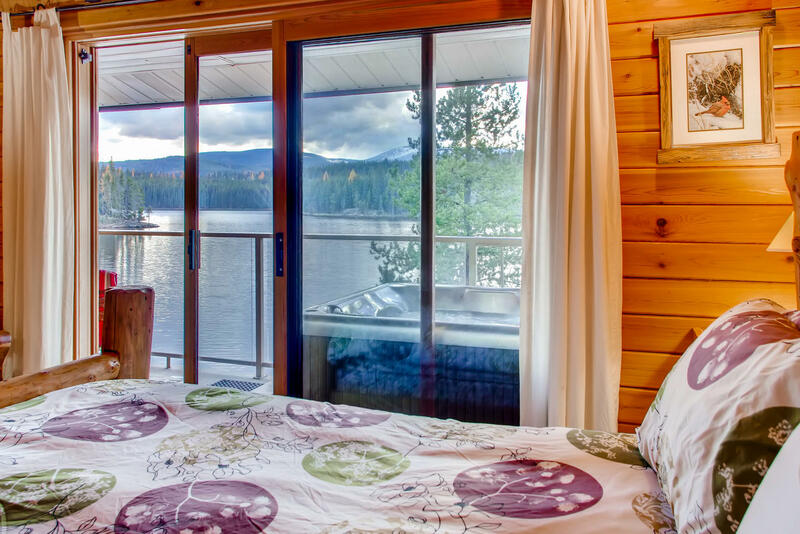 The second bedroom also provides hot tub access and stunning lake vistas through a second floor-to-ceiling glass sliding door. 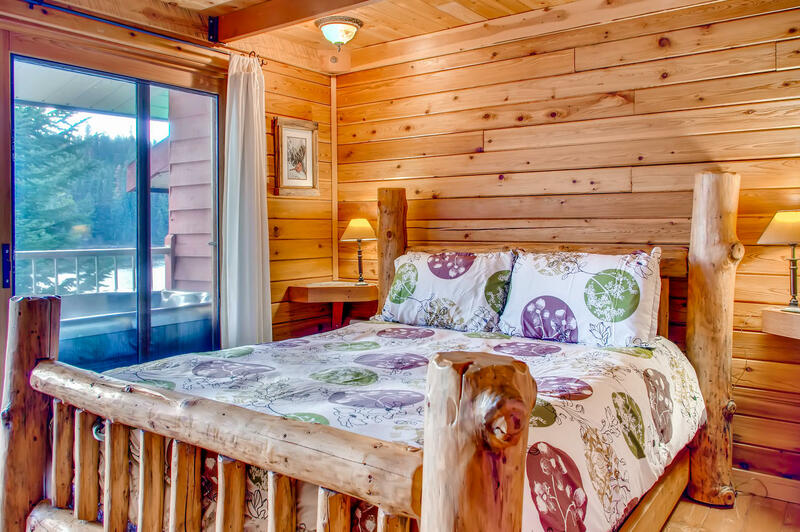 You’ll feel like royalty going to sleep on the queen bed with huge polished log bed frame. There are two built-in bedside tables, a wooden chest of drawers and closet to hang clothes out of sight. 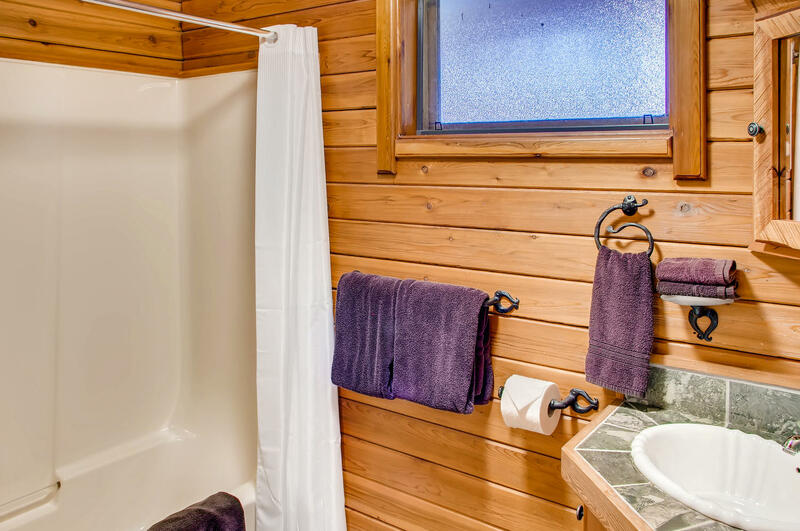 The main bathroom has a full bath with shower, toilet, modern corner vanity and heated slate floors for those chilly Winter mornings. 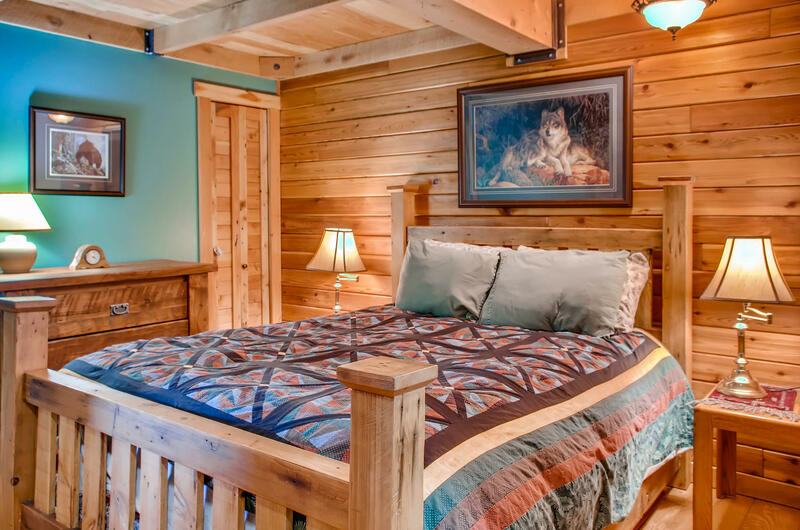 The master bedroom is extremely spacious, featuring a queen bed with solid wood mission-style bed frame, chest of drawers, bedside tables and built-in cupboards. A single couch which folds out to a bed has been built into a step-up alcove to add an extra sleeping space or you may want to pull it out for use as a daybed. 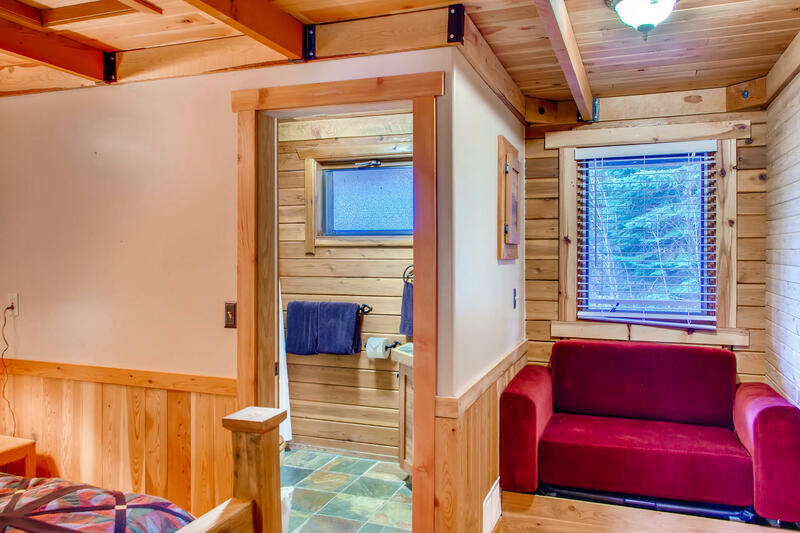 The ensuite has a full bath with shower, corner vanity, toilet and heated slate tiles. -The suite has an old fashioned TV just for viewing DVD films and VHS tapes. Reviewed February 27, 2018 by Tara S. of Kelowna, BC United States. Updated on March 13, 2018. Review of stay from February 24, 2018 to February 25, 2018. The Minnow Suite was great. It was very clean when we arrived and was perfect for 2 families to stay in. 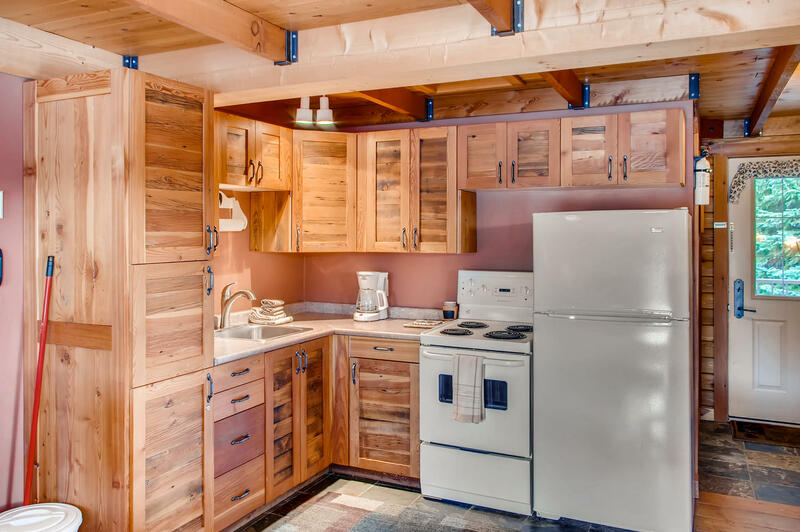 The kitchen was stocked with all appliances needed. Great wrap around deck! Hot tub was clean and hot and ready...even had hot tub towels to use! We were here during the winter and brought up our snowmobiles. Parking is a bit tight. Id stay here again and recommend this suite! Thanks Tara! We are glad you had a great stay at Idabel Lake. Reviewed January 31, 2017 by Coralea B. of , United States. Updated on February 12, 2017. Review of stay from January 13, 2017 to January 15, 2017. My sisters and I planned a winter get away for January. 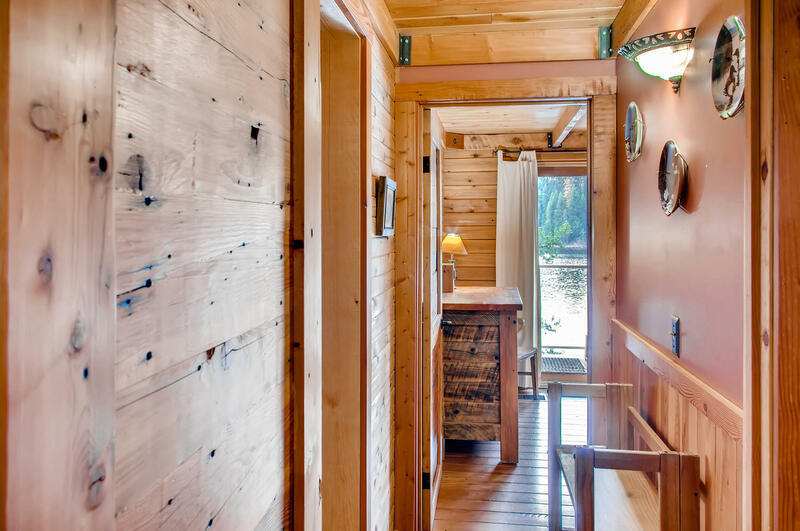 We stayed for two nights at the Minnow suite at Idabel Lake. We had an amazing time going snow shoeing and enjoyed the hot tub to relax in at the end of our day. We will definitely be back it is a winter wonderland at Idabel Lake. Thanks for taking the time to review your stay with us at Idabel Lake. It's great to hear you and your sisters had a great time exploring the stunning lake surrounds and taking advantage of the hot tub. We'd love to welcome you back to stay with us again soon. Reviewed February 6, 2018 by Matthew K. of Kelowna, BC United States. Updated on February 16, 2018. Review of stay from February 2, 2018 to February 4, 2018. 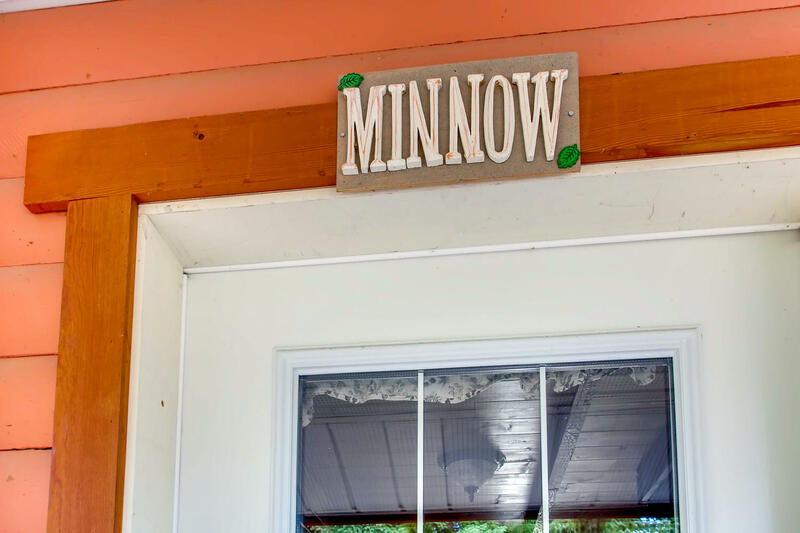 We had a wonderful time vacationing at the Minnow Suite this past weekend in February, 2018. The suite was very tidy and charming, and identical to the photos shown online. 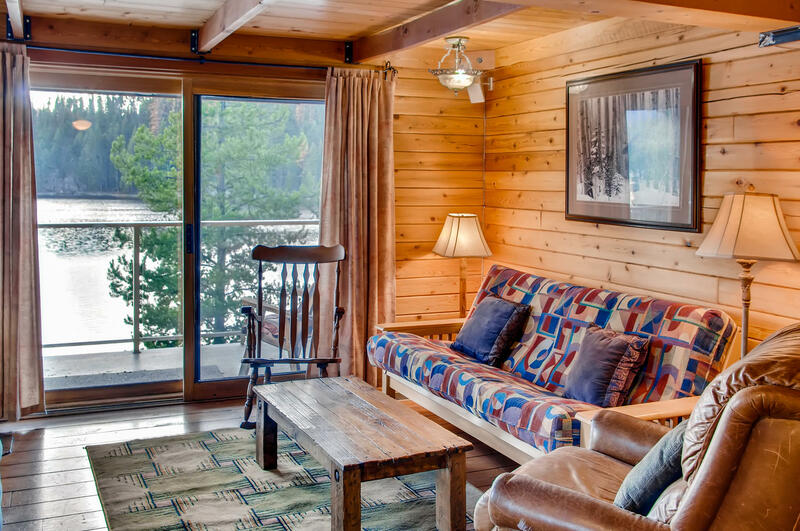 We highly recommend the suite. 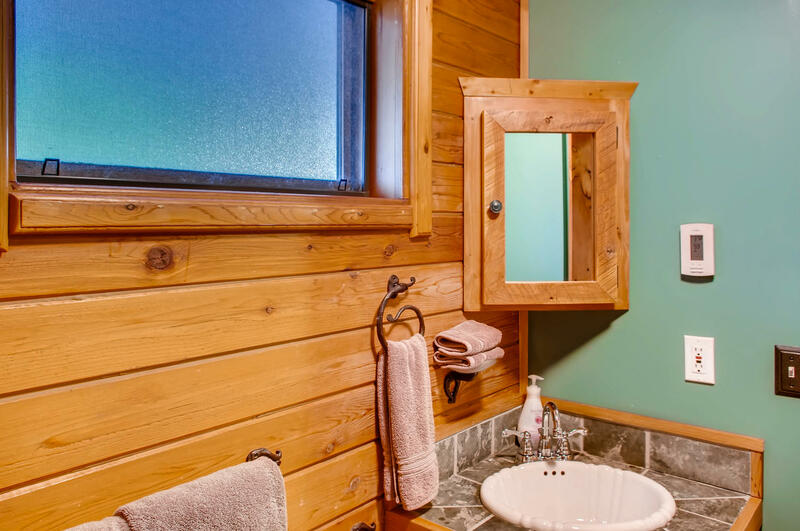 We are glad to hear you enjoyed your stay in Idabel Lake! Thank you for your review. Reviewed November 28, 2018 by Corbie B. of West Kelowna, BC United States. Updated on December 19, 2018. Review of stay from November 23, 2018 to November 26, 2018. Hi Corbie, We are very sorry to hear you had trouble locating the property! Did you manage to download our app prior to your trip? It documents some quite detailed instructions to locate the property. It can definitely become a troublesome thing when you lose cell service and aren't sure where you're headed. We are very glad to hear that the rest of the stay and the beautiful property made up for the initial frustration! We hope to welcome you back again in the near future! - Kelli. Reviewed January 30, 2018 by Jake O. of Kelowna Central, BC United States. Updated on August 30, 2018. Review of stay from January 12, 2018 to January 14, 2018. Easily accessible, even in the winter. There is a small community on Idabel lake, so the roads are well maintained. I was there in the winter, and the cabin was warm, and cozy.The power went out one night from a downed power line near Big White. We were able to cuddle up around the fire, and had a great time for the few hours until it was fixed (it was fixed that evening). We had a fantastic stay. 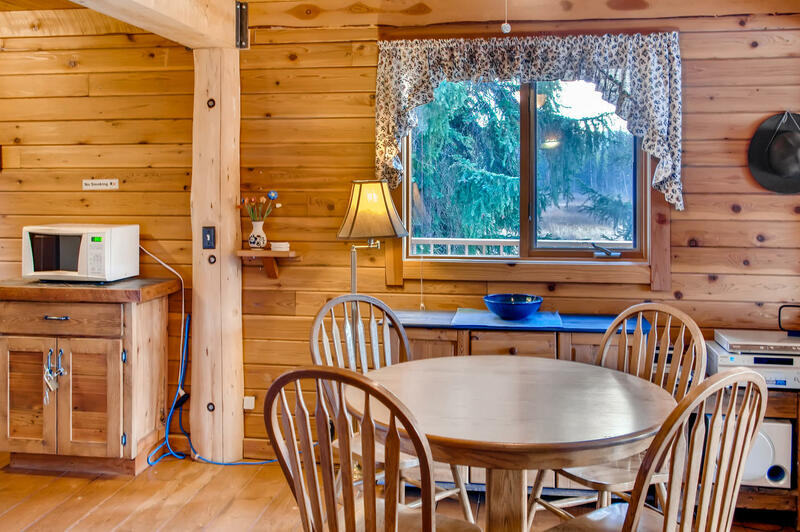 We are so pleased that you enjoyed your stay and that everything was easily accessible in this remote location. 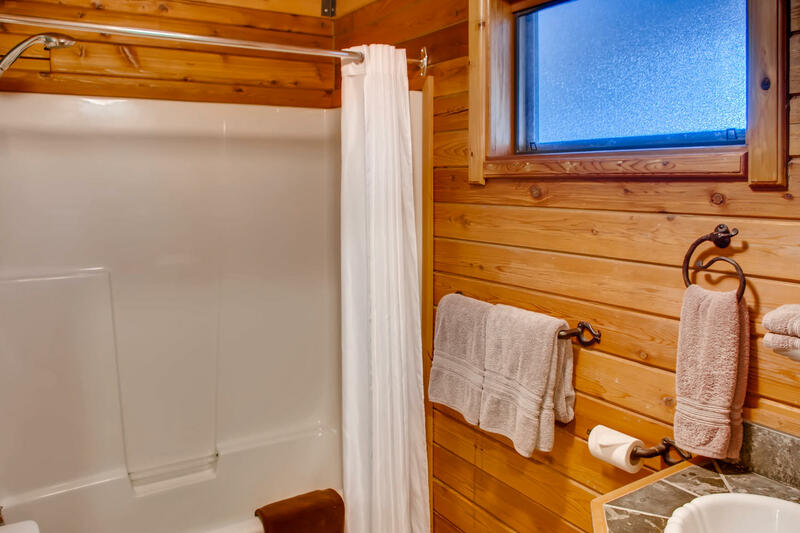 We are thrilled to hear that even in the event of the uncontrollable you were still able to keep warm and make the most out of your stay at Idabel lake. We are glad you had a fantastic stay and hope to see you stay with us again. Reviewed February 3, 2017 by Sandra F. of , United States. Updated on February 16, 2017. Review of stay from January 29, 2017 to February 1, 2017. Thanks for taking the time to review your stay with us. 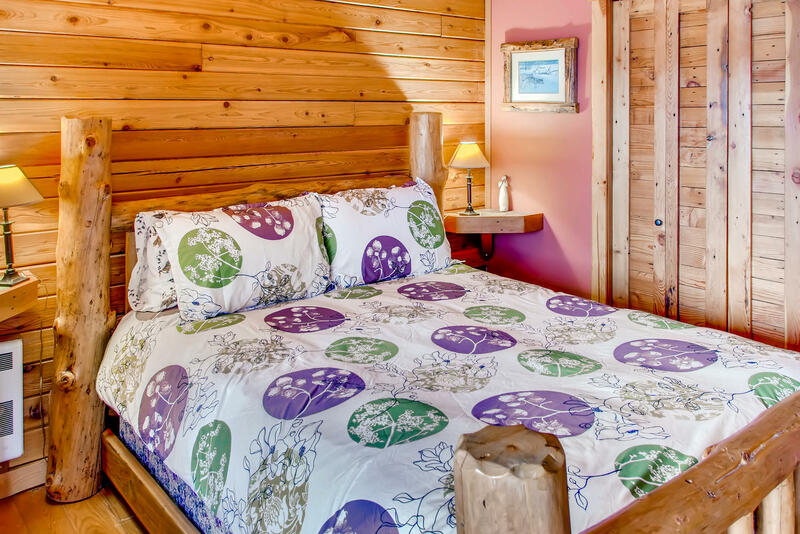 We're glad you found Minnow Suite cozy and well equipped! Thanks for letting us know about the hot tub issue, we employ our own in-house hot tub-maintenance staff so we will certainly have the problem fixed. We hope to welcome you back to Idabel Lake again soon! 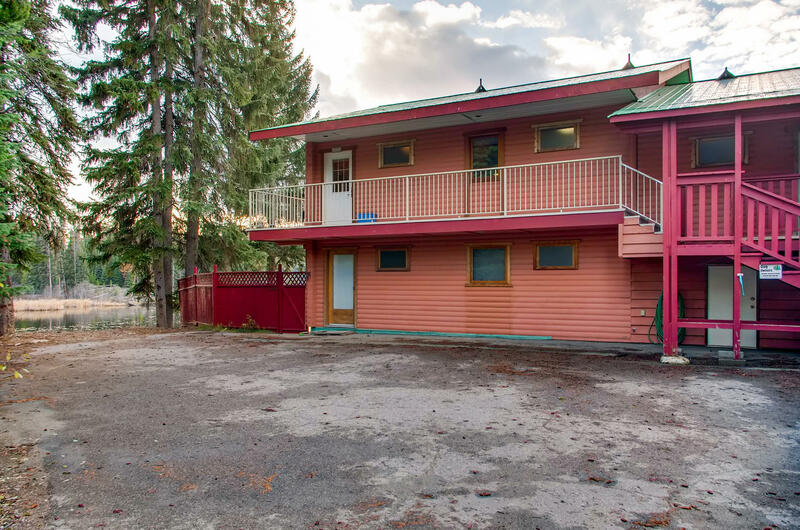 Reviewed January 14, 2019 by Unknown of Kelowna, BC United States. Updated on January 29, 2019. Review of stay from December 23, 2018 to December 28, 2018. We had an enjoyable time. Lots to do ...indoors and out. 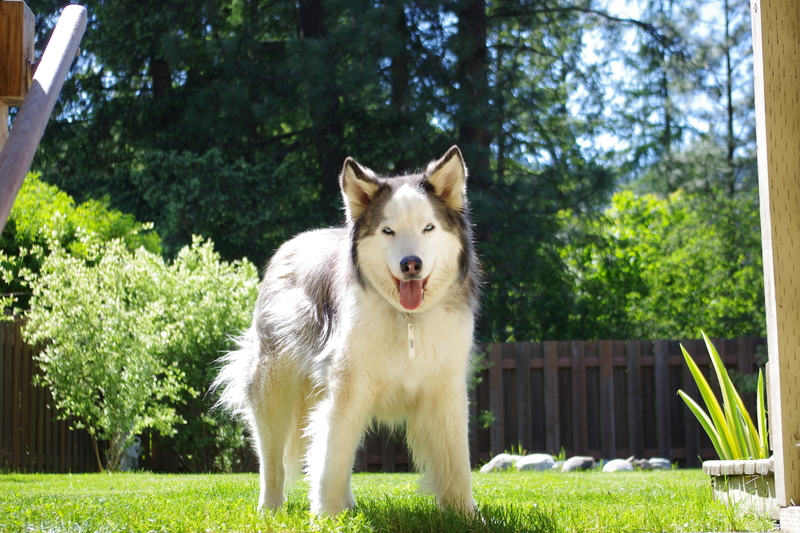 Hi Alan, We are so glad you had a great time in Idabel Lake! I hope you enjoyed the amazing views from the hot tub! Reviewed January 17, 2018 by Taylor O. of Estevan, SK United States. Updated on January 17, 2018. Review of stay from December 28, 2017 to January 1, 2018. 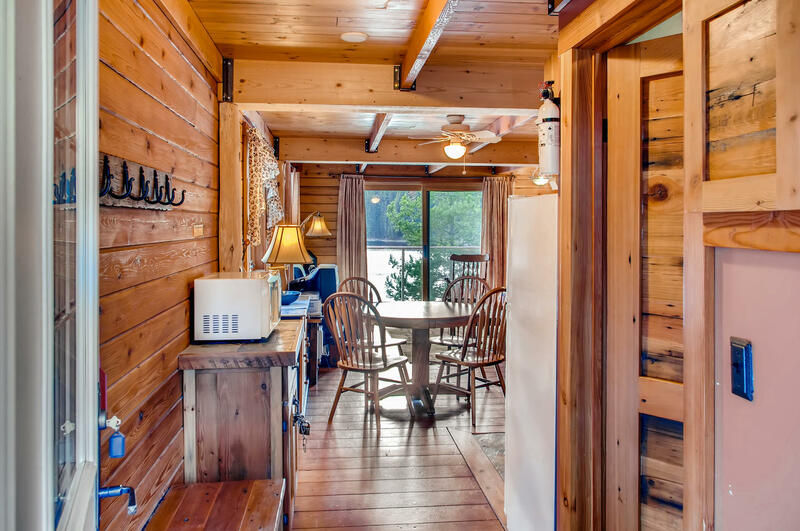 Our Cabin was very clean and comfortable. It had everything we needed to prepare meals and relax in the evening. I would book again with out hesitation. Reviewed September 19, 2017 by Unknown of North Vancouver East Central, BC United States. Updated on September 22, 2017. Review of stay from September 10, 2017 to September 17, 2017. The accommodation was very nice and rustic. The scenery was surreal. But we were a bit disappointed on the fishing though; maybe a bit late in the season. But it was nice to sit in the canoes and fish from the docks, watch the sunset from our balcony and relax in the hot tub after a day fishing and hiking. We were expecting a "pet-friendly" environment for our dogs. That was not the case when we arrived; so many restrictions on where we could take our dogs to enjoy the vacation with us. We resolved to take our dogs out of the resort for walks. There was no dog-park or dog-friendly area, so we were restricted to staying indoors with our dogs when we were at the resort as they were not to be left alone in the suite. Other than the pet restriction we found the resort okay but smelly at times (I think it had to do with their water intake from the lake issue they were having while we were there). Reviewed July 17, 2017 by Meriam P. of Surrey Northeast, BC Canada. Updated on July 23, 2017. Review of stay from July 10, 2017 to July 15, 2017. The place generally is great and enjoyed the lake, the free canoeing and its safetyness with all the life jackets ready in place. The accommodation is good. Our last day of stay was such a challenge as we have no water but management was able to find a way to have at least water available from the lake to use for washrooms. Reviewed September 2, 2017 by Hillary P. of Richmond Southwest, BC United States. 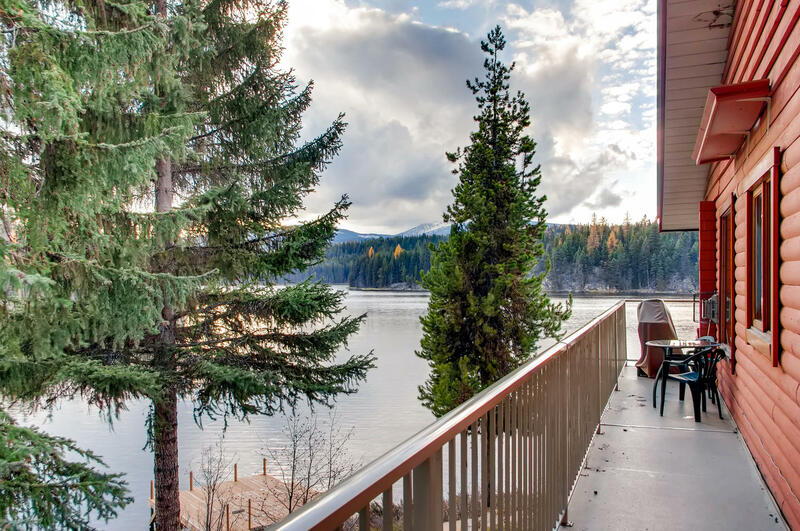 Updated on August 30, 2018. Review of stay from August 14, 2017 to August 17, 2017.
the location of the rental was beautiful. the inside of the suite was not. the bedroom door had a huge hole in it. the kitchen sink pipe broke and almost flooded the kitchen. one of yhe sitting chairs in the living room was broken. there were no refills of garbage bags. but the maintenance man helped with the garbage bags but there was nothing he could do at the time about the broken items. 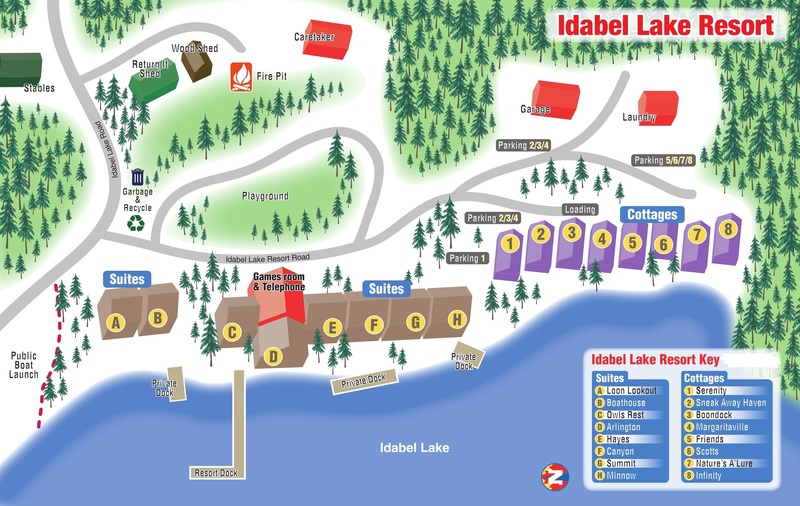 We are sorry to hear of these inconveniences during your stay at Idabel lake. We have made note of them and have made fixes since your stay. We have also made note of the updates this suite needs, and are glad to hear the Maintenance man Todd could be of service to you.